In celebration of all things creative, I post this article from the Telegraph.co.uk. 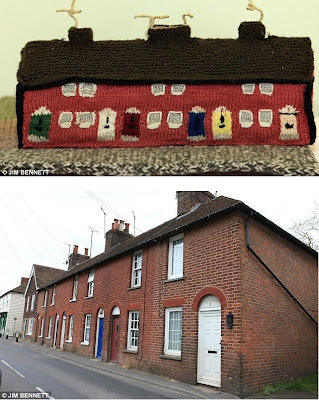 A model village which took 23 years to create entirely from wool has gone on sale. Many of the landmarks of Mersham near Ashford in Kent – population 1,022 – have been knitted by members of the village's Afternoon Club since 1986. Creations include the local primary school, the church, both pubs, the local shop, residents playing cricket, and even some of the local teenagers smoking a cigarette outside the bus shelter. Many of the houses have also been stitched, complete with flowers occupying the gardens and cars on the roads, to help capture a slice of everyday life of the village. Thousands of hours of intricate handiwork have gone into creating the knitted village over the past 23 years by members of the 40-strong Afternoon Club. The preparation involved taking pictures and mocking up cardboard templates of the properties and objects before the knitters wove their magic. With at least 100 knitted objects now, the village has become so large that for the many elderly club members it has become increasingly difficult to transport to exhibitions. 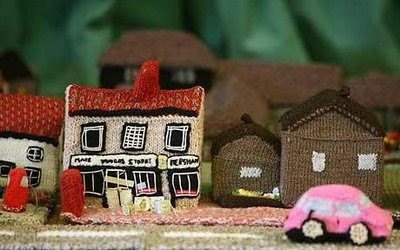 Next month the knitted village will be publicly displayed to enable people to come and choose their favourite stitched object, with proceeds going to the local hall. Afternoon Club member Joyce McDonagh, 82, a retired market researcher, said: "It will be a shame to see it all broken up but it has become something of an elephant. "Most of the members are now of pensionable age and we haven't got the men to lift the stuff. "It wouldn't be so bad if there were just two or three items but there are at least 100 now. It's massive and that's the problem." Another club member, 80-year-old Margaret Goldup, a retired local shop assistant, said: "We've gained so much pleasure from it over the years, particularly from taking it round different places to exhibit. "People all want to come up and take a look and they say things like, 'Oh, I live there. That's my house, but where's my cat'. Over the years we have raised £10,000 for the village hall through donations so it has been good for the village." More photos are available in a London Daily mail article. But here is one of favorites. The ladies did a very nice job, all the way down to the pipecleaner television antennas!